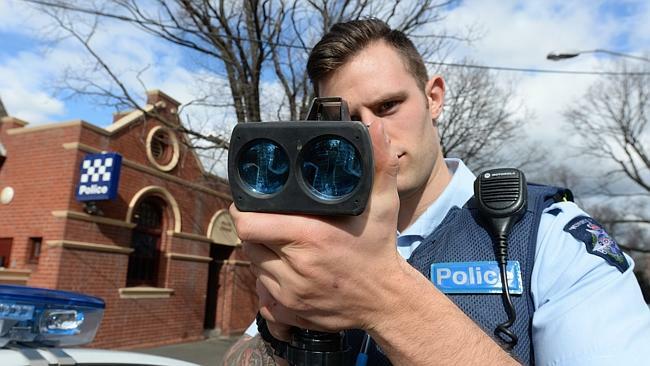 VICTORIA’S top traffic cop has told police to start fining more motorists for low-level speeding offences. Road Policing Command Assistant Commissioner Robert Hill said it was time to make travelling only a couple of kilometres above the speed limit as socially unacceptable as drink driving. He said more traffic operations were planned for this year than last year and speed was the main focus. “I expect there to be an increase number of low-level speeding infringements issued by our members in the future until the attitude is changed on our roads,” Mr Hill told the Herald Sun. “What we have said to our members is to focus on speed enforcement. The speed limits that are set at the maximum speed you can travel at, having regard to the road conditions. “If we can reduce our mean speeds across the road network we will save lives, and this is all about saving lives. Mr Hill said the strong stance on low-level speeding was being taken because 15 deaths and 300 serious injuries could be prevented each year if drivers cut their average speed by just 1km/h. He warned motorists to stop setting their own “de facto” speed limits, especially when setting cruise control. “The evidence is very clear; speed is the absolute killer on our roads,” Mr Hill said. “The culture has shifted in respect of drink driving, it’s now socially unacceptable for people to get behind the wheel of a motor car and drive while affected by alcohol, but the same cannot be said for ­speeding. Drivers who exceed speed limit by less than 10km/h are fined $180 and cop one demerit point, while speeding over the limit between 10-15km/h will cost $289 and three demerit points. During the past five years, 14 people have died and 352 people suffered serious injury during the Australia Day weekend. Police will run the year’s first major traffic operation to coincide with the public holiday break, with high focus on Melbourne, Geelong, Baw Baw, Benalla, Ballarat and the Mornington Peninsula. Posted on January 25, 2014, in ConspiracyOz Posts. Bookmark the permalink. 4 Comments. This is just one speck of sand on the “beach of the future”….the police state comes in many forms…the G20 this year is just a good excuse to accelerate the ‘visible’ police state…it is the invisible police state that is an even bigger worry….street cams everywhere…all communications..emails..phone calls…social media….then there is Big Govt…watching every transaction….Taxation…Big Pharma…The medical industry…Look at our current Govt. pushing to finalise the Trans Pacific Partnership…one of the final nails in the coffin of our freedom. This is a key block in the Agenda 21 brick wall…I voted for the co-alition, believing that we would be protected from the TPP….how wrong I was…both sides of politics are pursuing the same goals. The only difference is the smoke screen leaders..all jockeying for position on the New Global Control Grid…or Govt. ….The only thing we can do…send a link to this site to everyone you know…wake up as many people as you can…or…have another diet soft drink….wash it down with fluoridated water…get your “flu” shot….and the future won’t concern you….’cos ..you ain’t got one’….bit blunt….but true. Love, Mick. @Mick Augustus – spot on mate – I shake my head & wonder what it will take for the trusting, ignorant masses to ‘wake up’ to the bs media propaganda machine ‘conditioning’ everyone to think what they want them to think instead of thinking for themselves. How desperate are they for more revenue? Is there no end to their greed? Trials have been conducted overseas where speed signs were removed & the actual results were less incidents as drivers were not focused on their speedometers and Police waiting to pounce & could concentrate on the road & drove to the conditions. Sure there is always going to be idiots, but they are there anyway regardless. Penalising people for this type of crap (no corpus delecti-victimless crime) is a breach of common law. Our silence is what gives them consent, so it’s time to say NO MORE!! How much longer until we all work for the dole & hand it all over to them in return for a ‘basic’s card’ to barely survive on (not live on) – the machine knows no bounds, unless we draw the line in the sand & stand up to these pigs at the trough who then send it overseas while our own pensioners go without, our homeless are unhoused, our schools & hospitals closed or degraded, & people cannot afford medical or dental treatment while other countries provide those services freely & take care of their people? The apathy is heartbreaking. All you can do is…grow your own food…eat healthy..so that you are in control of your own well being….stay out of the clutches of the ‘big pharma rip off system’…economise…live within your means….put away for a rainy day…don’t trust the big banks…they view your funds as an unsecured loan to them…and they will steal it…same program as what happened in Cyprus. Invest in like minded people..help each other. Tommorow I am planting a fruit garden for a neighbour…so that they can feed themselves…and others…barter…just swapped dragon fruit for tomatoes…lemons for bananas…helped a friend to move on the weekend…gave me some building materials. What goes around..comes around…the best investment that you can make….is in other people. You can not change the system…too many ‘sheeple’ exist within it…and have ‘head in sand’ sickness. M.